Holly is nothing if not organized. 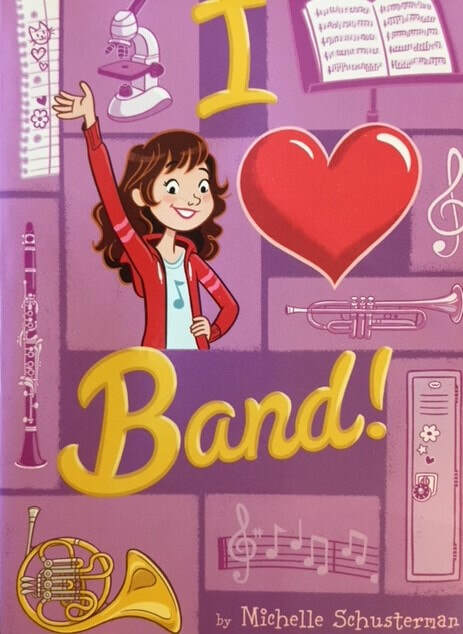 So when her first day of seventh grade is destroyed by A) her trollish brother Chad spilling orange juice on her new shirt and new backpack and B) her best friend showing up with a brand new bff from band camp that Holly didn't get to attend, her carefully ordered world begins to spiral out of control. A French horn player, Holly is excited to be in the advanced band with mostly eighth graders, but she can only be competitive there if she can keep up her grade in science. Her friendship troubles are a surprise distraction from the amazing year she carefully planned . . .
Holly is pretty self-absorbed, and her problems (Will she make first chair? Does that cute boy like me?) are not earth-shattering. However, many readers in this target audience are likely to relate to her worries and every-day drama. It's nice to have a book for perfectionist band members who color code their schedules, with friends who play card games with dragons - because those readers exist and it's good to see roles that aren't only athletes or people in serious crises. It's light-hearted, fast-paced, and somewhat predictable, but still a fun, quirky ride. "She talked about herself constantly. How easy band was. How easy all her classes were. She was so good at this. She was so good at that. So. Irritating. I really didn't get why Julia couldn't see it."